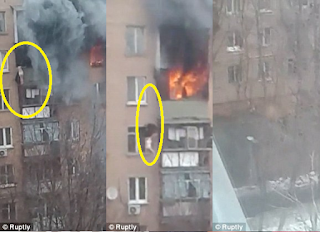 A yet to be identified lady who was almost burnt to death in a fire incident that razed down her flat in Moscow, Russia, fell from the burning 8-storey building and escaped miraculously. hold on to the balcony railings. She then slipped and fell backwards seemingly to her death, but she survived. DailyMail reports that the lady who went into coma afterwards, was rushed down to the hospital in a ready ambulance, where her injuries was treated. She was also treated for smoke inhalation.